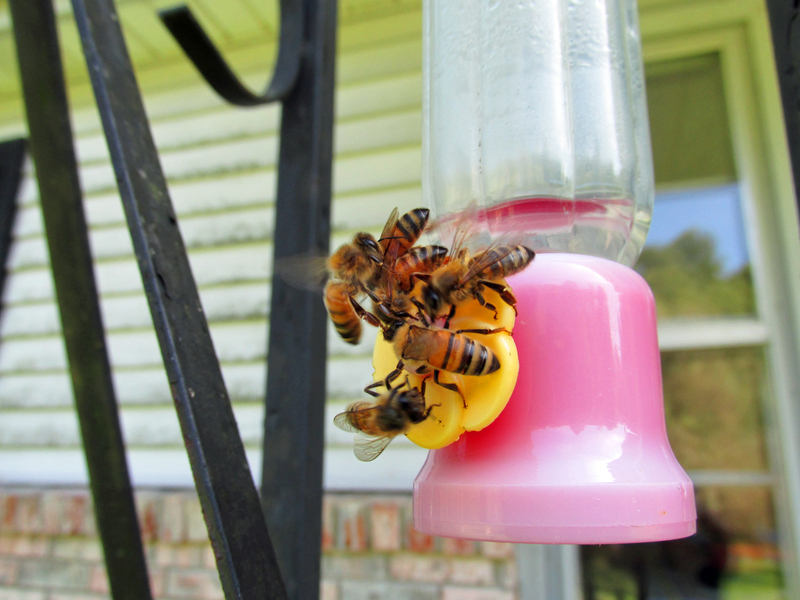 The plastic yellow guards are meant to exclude bees and other insects from your sugar water feeders for hummingbirds. I’ve had some Facebook queries recently from fellow hummingbird enthusiasts hoping I can offer a solution to the problem of bees overwhelming their feeders. Bees, as well as other insects, are attracted to sugar water. To complicate the problem, bees far outnumber hummingbirds and can quickly make themselves a nuisance. Although hummingbirds are brave enough to challenge one or two bees to a duel, these tiny birds usually shy away from feeders that have attracted swarms of these stinging insects. Honeybees can cause problems at feeders; however, methods for dealing with these important pollinators should always be non-lethal. The most effective solution is to buy a feeder with bee guards, which are simply little plastic shields that allow access for hummingbird bills and tongues but ban bees from squeezing their bodies into a position to reach the nectar solution. 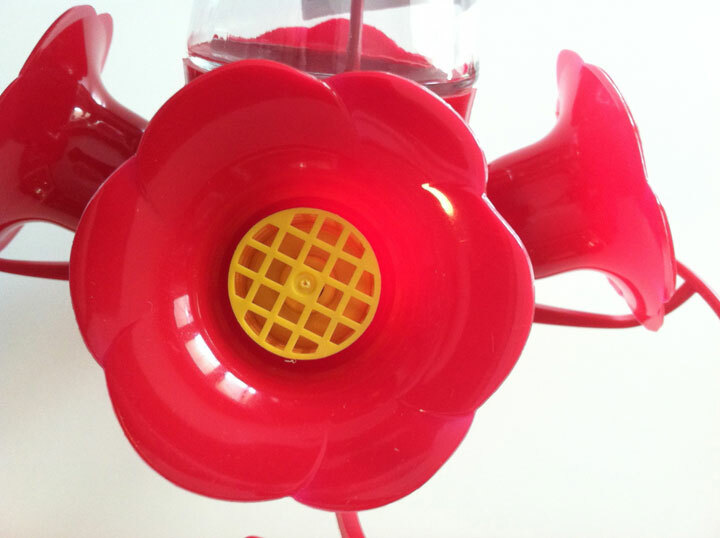 Most hummingbird feeders are red, which is supposed to capitalize on the hummingbird attraction to that color, and the bee guards are usually fashioned from yellow plastic. Some of the guards are fashioned to look like tiny yellow flowers to make them more aesthetically pleasing. Online research also offered a solution that could make everyone (people, hummers and bees) happy. Provide a bowl of sugar water for the bees. They will find it quickly. Gradually move the bowl away from your hummingbird feeders. If this works, both bees and birds can co-exist. Remember that honeybees are an extremely valuable insect, so any solution to bees invading your hummingbird feeders should definitely be non-lethal. 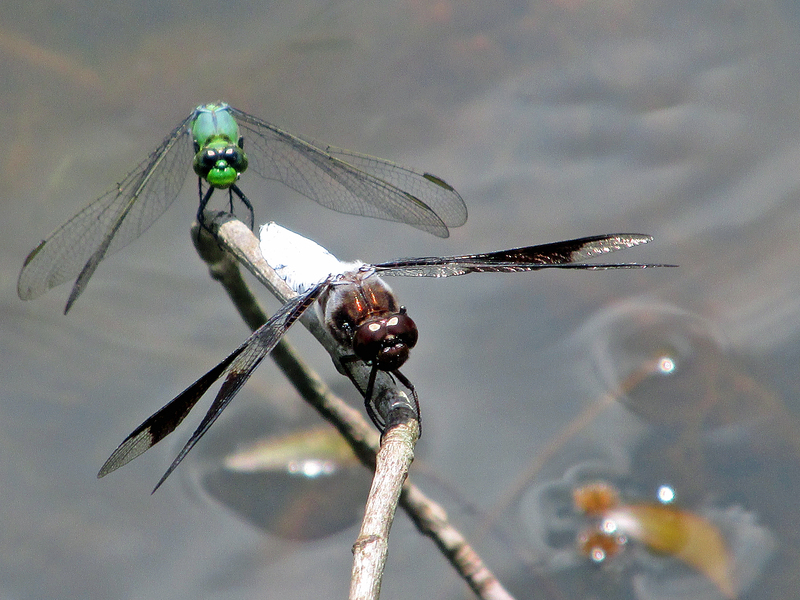 A couple of different dragonflies share a perch at water’s edge. Specifically, I would discuss dragonflies and damselflies, otherwise known as “odes,” or members of the insect order of Odonata. Surprisingly, other than their wings, the odes and birds have a lot in common. When birds are scarce during the heat of the day, I find that other winged creatures get active and can provide some fun observations. 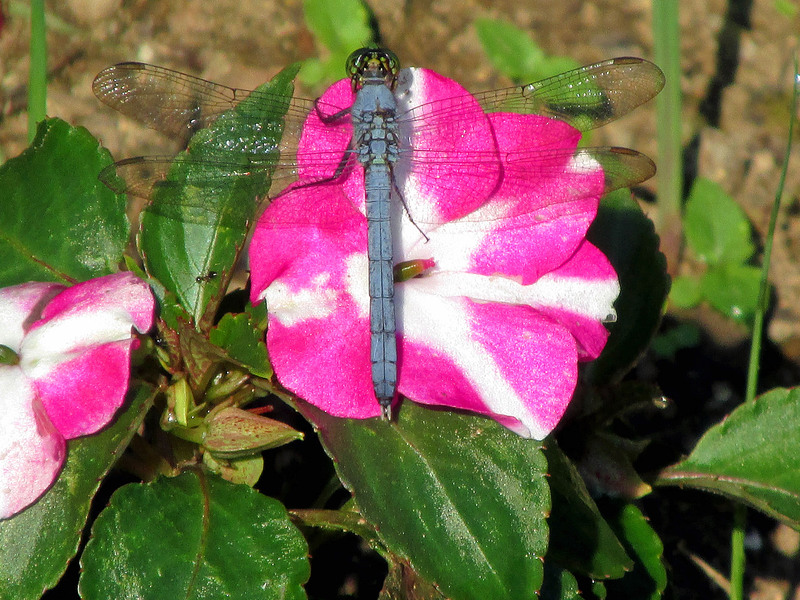 In late summer I spend a great deal of time focused on the dragonflies and damselflies that live along the creek and at the fish pond at my home. The “odonates” are insects with long brightly colored bodies, two pairs of membranous wings and large compound eyes. Blue Dasher chooses a prominent perch at a fish pond. 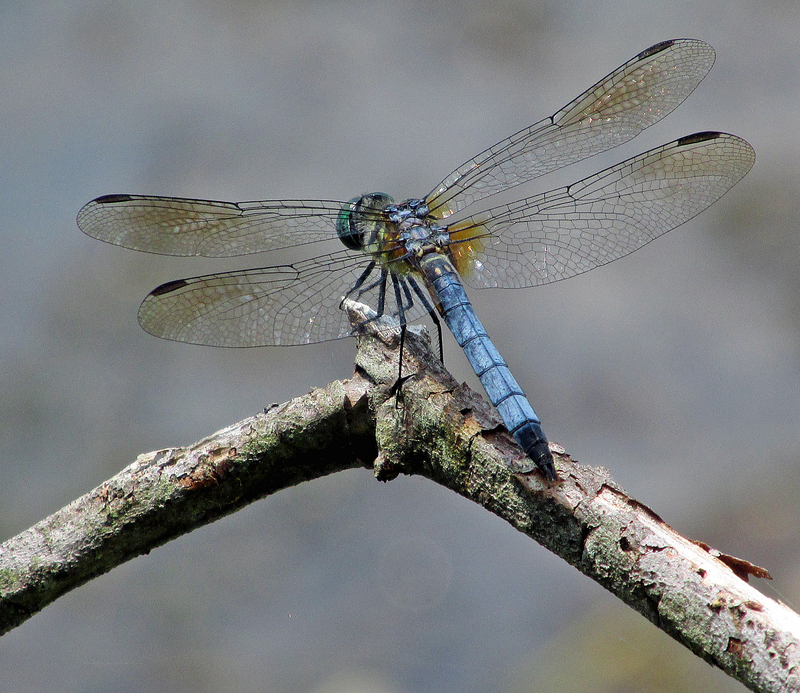 Some of the more prevalent dragonflies in the region include widow skimmer, common whitetail, Eastern pondhawk, Eastern amberwing and slaty skimmer. I also often find the ebony jewelwing, a species of damselfly, fluttering along the creek. These delicate-looking insects like to find a sunny perch near flowing water. I’ve noticed the ebony jewelwings for many years because they are particularly difficult to miss. They have dark wings and a tapering body that glistens with a metallic blue-green sheen. Damselflies, which are closely related to dragonflies, are usually smaller and less swift. A dragonfly at rest keeps its wings extended horizontally like an airplane’s wings, but damselflies fold their wings over their backs. All odes are predators, feeding on other insects, but they are harmless to humans. Despite an enduring myth, they cannot sting. They are capable of biting, but will not do so unless they are handled in a careless manner. If you observe dragonflies long enough, you will start to notice they share one trait with hummingbirds: they are intolerant of any intrusion into their personal space. In the same manner that hummers constantly chase rivals away from a favorite perch or feeder, dragonflies along the edge of a pond are unceasing in chasing and harassing rivals. Blue Dasher striking a pose. Despite superstitions about them, dragonflies are harmless. They can’t sting and don’t bite unless provoked. Some cultures consider a dragonfly landing on a person a sign of good fortune. My sister-in-law would disagree. She has an intense, if irrational, fear of dragonflies. Perhaps she learned too much of the misinformation handed down in various human cultures about dragonflies. Europeans have long linked dragonflies with sinister forces. Some common names for dragonflies, such as darners, come down from older names such as “devil’s darning needle.” Swedes call dragonflies “troll spindles” and Norwegians refer to them as “eye pokers.” Some cultures in South America call dragonflies “horse killers” and others refer to them as caballito del diablo, or the “devil’s little horse.” Some residents of the Southern United States refer to dragonflies as “snake doctors,” believing these insects can stitch and repair any injuries that a serpent suffers. It’s no wonder some people fear a harmless and rather beneficial insect. 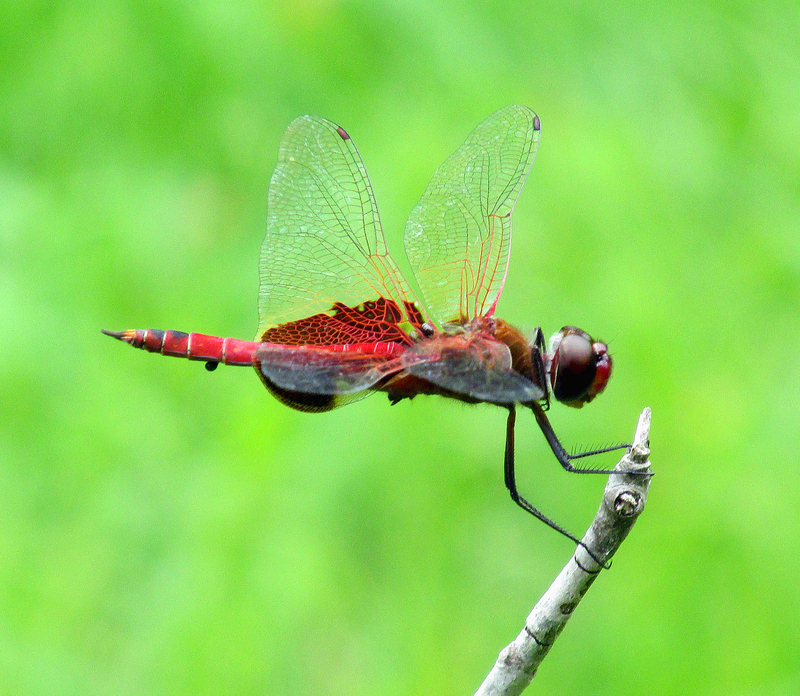 The Carolina Saddlebags, pictured, is one of the species of dragonflies known to migrate. 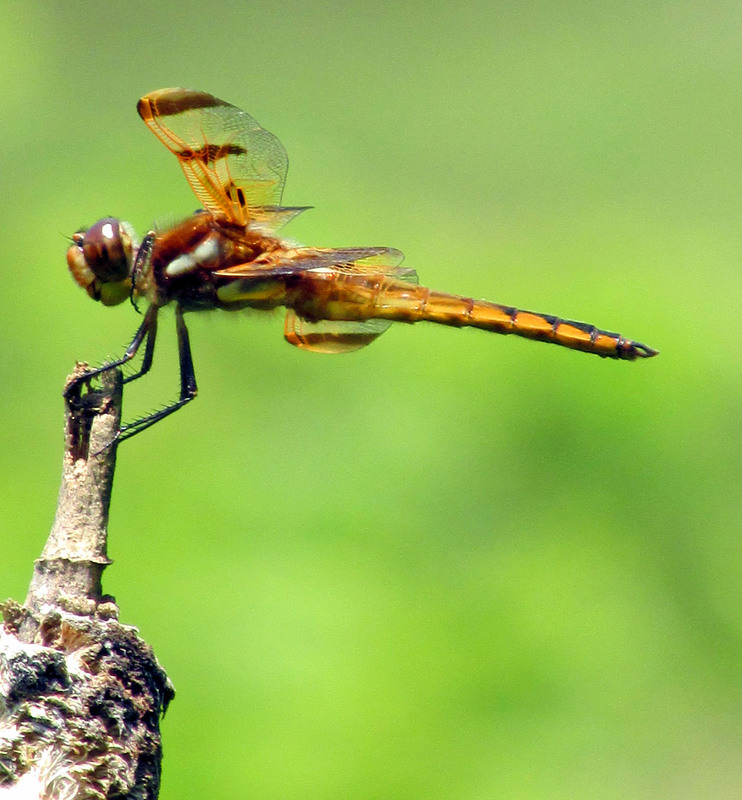 Native Americans as well as some Asian cultures have a more positive outlook on dragonflies. In Japan, dragonflies represent such concepts as strength, courage and joy. Dragonflies are often depicted in Zuni pottery, and the Navajo use the dragonfly as a symbol to represent “pure water,” which was an important resource for people living in very arid conditions. 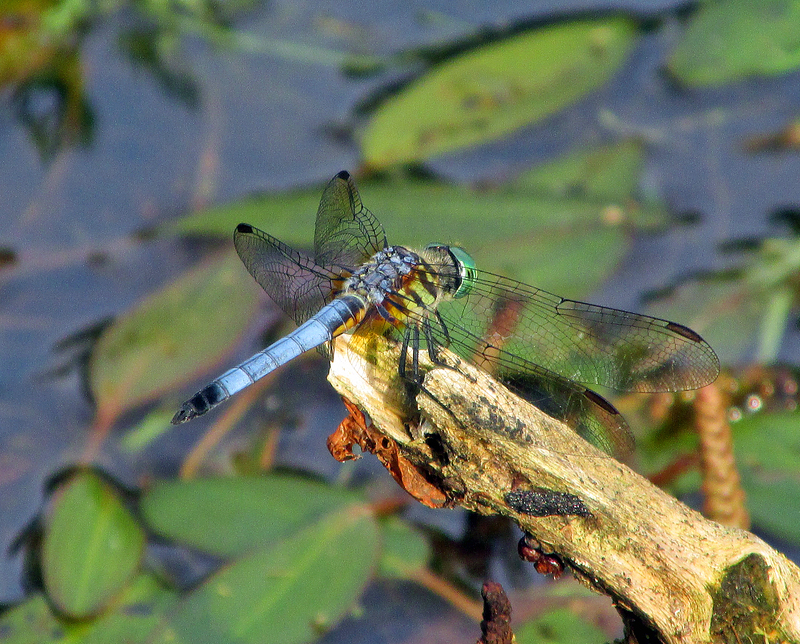 For both birds and dragonflies, water is also a crucial resource if they are to thrive. The Hopi and Pueblo tribes also incorporate dragonflies into their art. Many Native Americans consider dragonflies a symbol of renewal. Many others see them as a symbol representing illusion and seeing through deception. I wonder if the use of the dragonfly as a renewal symbol evolved because of the life cycle of dragonflies. Odes spend the first stage of life as aquatic larvae living below the surface of the water. Later, they emerge as adult dragonflies. During their time spent as larvae, or nymphs, they are voracious predators, tackling other aquatic organisms, including small fish. At the same time, these nymphs are important food sources for some larger fish. Nymphs may spend as long as three years living beneath the water, but adult dragonflies usually live only a few weeks or months. Blue Dasher surveys its territory at a fish pond. Adult dragonflies continue to consume prey, which is mostly other insects. Among the odes, there are no vegetarians. “Mosquito hawk” is another common name for them because they catch and eat mosquitoes. They also consume gnats, flies and other insects. So, along with birds such as swallows and nighthawks, the dragonflies help keep in check the numbers of many nuisance insects. Some of the larger dragonflies are also reputed to attack and eat hummingbirds. I tried to find conclusive evidence, but the jury’s still out in my opinion. However, some of the larger species of praying mantis have been documented capturing and consuming hummingbirds, so it is not too far-fetched to believe some dragonflies might be capable of preying on hummers. Like many birds, some dragonflies migrate. Species such as Carolina saddlebags, green darners and wandering gliders are known to migrate hundreds of miles. Painted Skimmer clasps a cattail. 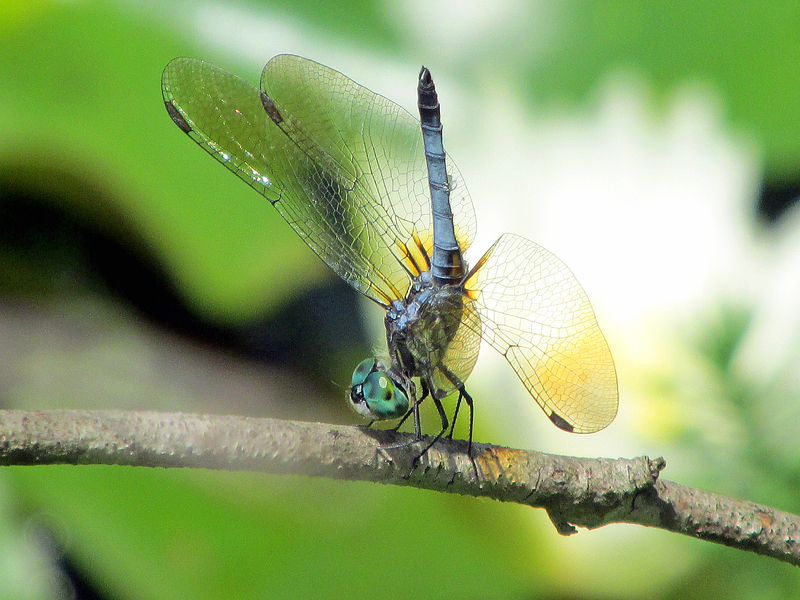 In recent years, dragonfly-watching has emerged as a nature pastime to rival the watching of birds and butterflies. Why watch dragonflies? Well, in many ways, they are just as fascinating as birds and other wildlife. • Odes have excellent eyesight. Their compound eyes have up to 30,000 facets, each of which is a separate light-sensing organ arranged to give nearly a 360 degree field of vision. Their vision also makes it difficult to sneak up on a dragonfly. I have learned this during my attempts to photograph them. • Dragonflies are built for speed. Many experts credit dragonflies with the ability to fly at speeds between 19 to 38 miles per hour. They have also been documented traveling as much as 85 miles in a single day. • Dragonflies can hover and fly backwards, a feat achieved by only hummingbirds among our winged friends with feathers. • Dragonflies are ancient. They appeared 100 million years before dinosaurs and 150 million years before birds. Eastern Pondhawk perches on an impatiens bloom. • The largest dragonfly to ever live was Meganeura monyi, which lived during the Carboniferous period about 300 million years ago. It resembled and was related to present-day dragonflies. With a wingspan of almost 26 inches, it is one of the largest known flying insect species. • Worldwide, there are about 5,000 species of dragonflies, but only about 400 are found in North America. This entry was posted in Birding, Birds, Dragonflies and tagged Carter County Compass, Dragonflies, Elizabethton Star, Erwin Record, Feathered Friends, McDowell News, Our Fine Feathered Friends, Ruby-throated Hummingbird, The Erwin Record on July 26, 2015 by Bryan Stevens. Great dragonfly pictures Bryan! Good article too.